Hearing shouts of alarm from down the block, the office workers, tourists and shoppers in the lunch-hour crowd thronging the corner of Fourth and South Spring streets one cold afternoon in 1905 turned to see a runaway horse, pulling a light runaround cart, charging towards them with frightening speed. Some of them ran for safety, some froze, too scared to move; none of them tried to stop the horse – it would be madness even to try. Luckily, the police officer who was on duty at the intersection that day was Patrolman Billy Matuskiwiz, who happened to hold the record among patrolmen for stopping runaway horses, having bravely halted 20 during his 12 years on the force. Officer Matuskiwiz stepped to the middle of the street and waited as the horse sped towards him. 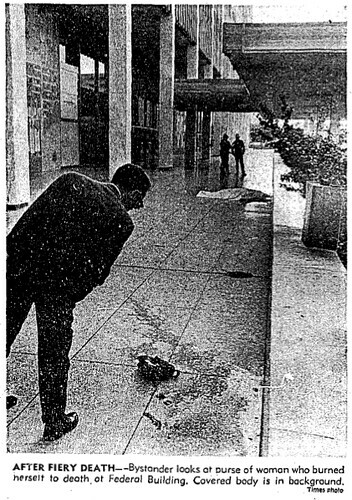 When it drew near, however, it swerved and dashed straight toward a crowd of tourists outside the Angelus hotel. Matuskiwiz leaped at the horse but found that it had no bridle or halter. Some men would have given up at that point, but not Officer Matuskiwiz, who decided to throw his arms around the animal’s neck and squeeze its throat with all his strength, clinging on as it flung its head back and forth to throw him off. Half a block later, Matuskiwiz had succeeded in choking the horse into submission, and brought it to a halt just outside the hotel. As Matuskiwiz led the animal away, the crowd burst into heartfelt applause. 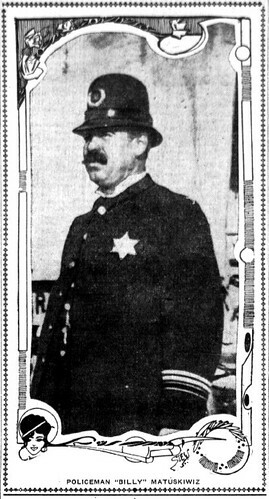 The newspaper allows the officer a few paragraphs in which to relate the event that made this horse-choking man of steel adopt such a tender philosophy. It features runaway horses, which may well have been a necessary element of all of Matuskiwiz’s stories. “I was taking Juan Silvos, a young Mexican charged with a heinous crime, to San Quentin,” explained Matuskiwiz. “Silvos had ten years at hard labor staring him in the face. I kept him handcuffed to me on the train. At San Francisco we missed our boat by a margin of several minutes. It would be an hour before the next one would leave. My prisoner complained of being hungry, and somewhat in the same frame of mind myself, we started across Market street in the direction of a little restaurant. Silvos was handcuffed and I held him by a small chain. “When we reached the center of the street I heard a woman’s piercing scream and looking back saw a little child some four or five years old toddling from its mother into the path of a runaway team. The horses were within several feet of the child. I forgot all about the prisoner in the child’s danger, and springing forward almost before I realized what I was doing, had snatched the little girl from under the horses’ feet. In the meantime the mother had fainted and in the excitement of the gathering crowd I ran to her side with her daughter and lifted the mother to her feet. The woman recovered and wanted to know who I was. Her question brought to my mind the fact that a ten-year prisoner was in my charge. Silvos in the meantime had had plenty of time to escape, but turning around I found him at my side quietly looking on. I asked him why he had not attempted to escape. He told me that I had thought of him when he was hungry. “Instead of taking him to San Quentin on the next boat I immediately took the handcuffs from his wrists and showed him the town. We took in everything that was doing, had several good dinners and caught the night boat to the prison. I told the warden of how he had acted and the chief promised to take his good behaviour into consideration. Billy Matuskiwiz was as tough and fearless as any police officer who ever walked the streets of SRO land, and he was a liberal, too! All Angelenos should remember him with admiration – and all Angeleno horses should remember him with respect. Sources: Los Angeles Herald: Jan 20, 1905; May 16, 1910. Late on Sunday morning, Florence Beaumont, 56-year-old former English teacher, Unitarian peace activist and mother of two, gathered a selection of literature pertaining to her activities in the anti-Vietnam war movement, climbed into her pickup truck with its Peace and Freedom Party bumper sticker and drove from her home in La Puente to downtown Los Angeles. On Tuesday, Florence’s widower George held a press conference at the Greater Los Angeles Press Club, where he read a prepared statement saying that he had not known what she planned to do. He said his wife had been deeply troubled because it seemed that elected officials didn’t care about her concerns. Exactly one week after her death, 500 people gathered at the site of Florence’s immolation to honor her memory. 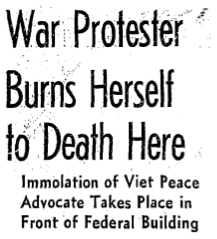 She was one of five people who died after setting themselves ablaze in America to protest the war in Vietnam. Eight years later, the war ended. Up until the fall of 1906, an Angeleno could walk into a pharmacy downtown (or discreetly dispatch a messenger boy) without a doctor’s prescription and buy morphine, cocaine, opium, codeine, heroin, laudanum, carbolic acid or other potentially fatal poisons, packed for his or her convenience in nickel, dime, or 25 cent bags. 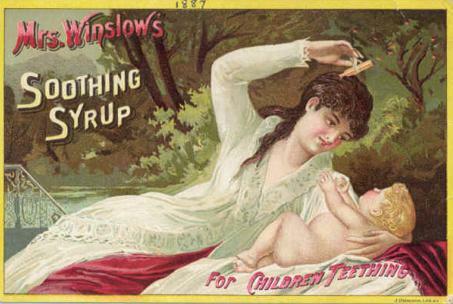 Of course, many of these drugs were highly touted miracle ingredients in the elixirs of the day, thought to be so beneficial, in small doses, that they were suitable for children. 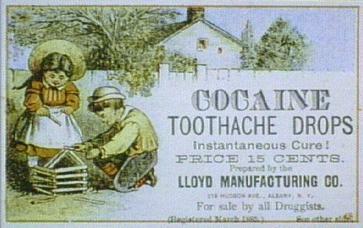 But 1906 brought a slew of new ‘poison control’ laws, which required pharmacies to employ only registered pharmacists to dispense drugs, to maintain a “poison registry” of the names and addresses of customers who purchased medications deemed dangerous, and to refrain from dispensing such drugs without a prescription from a licensed physician. 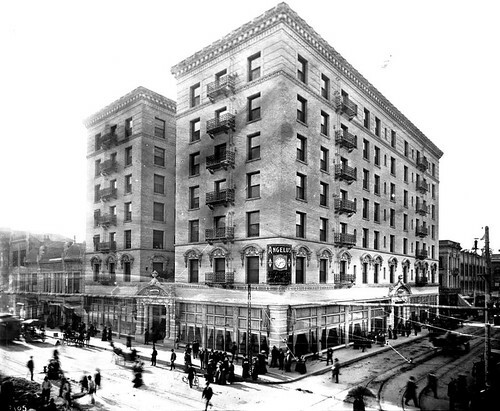 The laws were not strictly enforced until May of 1907, when a crusading Secretary of the State Board of Pharmacy by the name of Charles B. Whilden made a sweep through 33 drug stores in downtown Los Angeles and bought dope at 16 of them. At Wilson’s Pharmacy at 6th and Figueroa a young boy behind the counter sold Whilden carbolic acid; a few days later a young lady, presumably the boy’s mother, but no registered pharmacist, sold him laudanum. Similar transactions occurred at Frank T. Rimpau at 355 North Main Street, F.J. Giese at 108 North Main Street, Los Angeles Pharmacy at 212 West Fourth Street, Angelus Pharmacy at 801 West Third Street, and many other downtown retailers. The pharmacies were fined $100 for each violation. Several of the owners argued at sentencing that if future regulations prohibited them from selling opiates they would have to close their doors, as these products accounted for more than half their total profits. 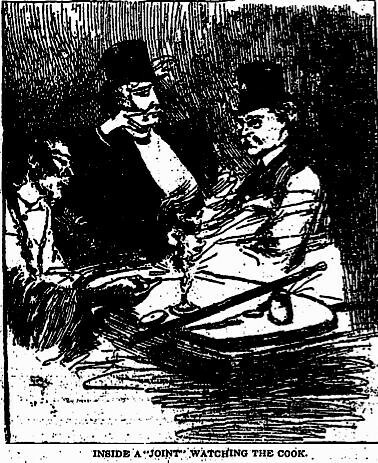 In June Whilden continued his poison investigation in Chinatown, where he arrested four proprietors of opium dens, even though the dens were licensed and the opium sellers paid a monthly fee of $25 to the city. All offenders were released after payment of fines, and business returned to usual in the downtown dens of vice. “Captain” Maximilian Wolf, self-styled, was a visionary of early Los Angeles. He arrived from San Francisco with a colleague who planned to host a fair at Hazard’s Pavilion at 5th and Olive, went mad for a spell, was freed, then entered into a period of creative mania. In 1896 he sought to demonstrate the efficacy of his theories on alternative transport by way of a Water Bicycle, a device comprised of two fifteen-by-two-foot pontoons on each of which a bike was placed. 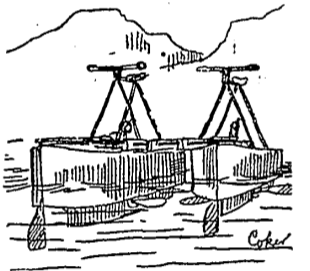 By pushing the pedals, a series of cogs revolved, eventually powering two fishy fins beneath each pontoon. Put an awning up, and one could enjoy a cigar or cool tea on the open water. A rudder, at the front of the device, turned with the handlebars–but Wolf refused to tell reporters what would happen if the two riders wished to go in different directions. Perhaps this is a design flaw the good “Captain” should have paid more mind to, as the planned date for his demonstration ride in early 1896 slipped always over the next wave. For machine shop owner S.D. Sturgis, who had built the marvel “on spec” was now holding the craft hostage in the back of his store, insisting Wolf pay for the work before any lakeside show was put on. When Sturgis appeared, a nervous Wolf scurried off, mid-interview with a man from the Times. Months passed, and there was no report of the wonderful Water Bicycle ever getting wet. Wolf turned instead to designing an air ship and told all who would listen how marvelous it would be when completed. Then in September, Wolf took a most peculiar cab ride with a hack called H.A. Lowell. He asked first to be taken to County Hospital, complaining on the way of blood poisoning. 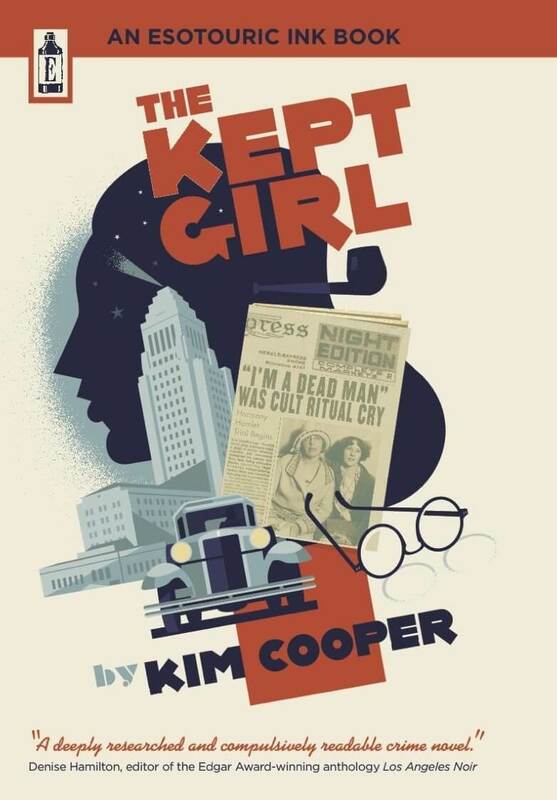 But on learning there were no private rooms available, he asked Lowell to continue on to Boyle Heights, to his old friend Mrs. Hollenbeck’s home where all the old folks stayed. He wrote a letter in German for the lady, but she claimed not to know him and turned him away. From there, Lowell was compelled to convey Wolf to a nearby nursery, where the German proprietor reluctantly admitted to knowing the passenger, but refused to loan him $5. Then Wolf asked to be taken to the Masonic Hall, but the exasperated Lowell took him instead to jail, where he was relieved of his gold-headed cane and the lunacy commission called in. Wolf then vanishes from the record, and his marvelous, futuristic craft with him.